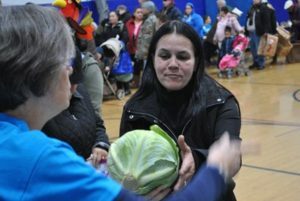 Boys and Girls Club, the event distributed a feast of common holiday foods to roughly 300 families who could not otherwise buy that food. 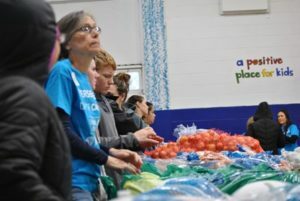 Relying on donations from individual community members, businesses, and local food pantries, the Community Cupboard rallied dozens of volunteers and the support of 10 businesses and organizations to provide a service which attendees, organizers said, deeply appreciate. 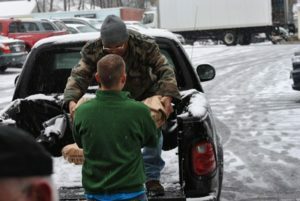 “They’re so happy and grateful that they have all this food for a meal,” Cupboard director Barbara LaGrenade said. In addition to the United Brethren Lodge and Marlborough Mayor Arthur Vigeant’s office, businesses helping particularly staff the event included Definitive Healthcare, Boston Scientific, Berkshire Bank, Dell, Eversource, St. Mary’s Credit Union, United Brethren Lodge, eClinicalWorks. After yet another successful food distribution, many from those businesses and the others they work with on this project are excited about its future and growth over recent years.